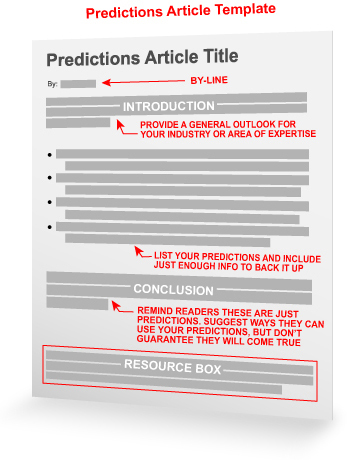 We predict this article template will help you quickly write and submit another great set of high-quality, original articles. Using this article template, you can quickly tap into your particular knowledge and expertise to generate articles that are both enticing and provide a high-value insider perspective for your readers. The key is to create relatively safe and peer-accepted predictions that contain relevant, useful information that may not be readily apparent to your non-expert audience. Narrow Your Topic Area – The most meaningful predictions are those your readers can use in their daily lives or careers. Predicting how money markets will perform will probably attract more interest than a list of general economic predictions. Write a Revealing Title – Expert Author Susan Kohlback put an irresistible title on her travel-trends article: “Travel Predictions For 2010 – Unexpectedly Good News!” Although the article follows a different format than this template, the title is a great example in that it states the topic (travel), sets the time period (2010) and hints at the article content without giving it away (e.g. “Unexpectedly Good News!”). Add a One-Paragraph Introduction – Provide a general outlook for your industry or area of expertise, or review past predictions and how close they came. If you’re listing predictions for the banking industry, for example, you could sum up the previous year of economic activity and whether the general outlook is positive or negative. List Each Prediction Separately in a Bulleted List – Your readers are probably pressed for time. So, make each prediction easy to scan. Your readers will get much more out of your article and be more likely to read it completely. Include Information to Back Up Each Prediction – Readers need to understand why you believe gasoline prices will go up or down. You don’t need excruciating detail, but you should provide enough background to give your predictions more credibility. Be as Specific as You Can – No one expects you to predict exactly how many games the New York Yankees will win this season. However, your readers will want to know whether you believe the team has the potential to make the World Series. So don’t hesitate to take a stand and back up your claim with evidence. Conclude with a Caveat – Here you can remind readers that your predictions are just that: educated guesses based on your experience and knowledge of the subject. Suggest ways they can use your predictions, but don’t guarantee that they will come true. A Word of Caution: Despite the fact that this template, by its very nature, is time-based, be very conscious of ways to keep your content as evergreen as possible. Many people write prediction articles at the end of the year or early in the New Year, but you don’t have to wait for December. This template can be used at anytime during the year – as a matter of fact, you’ll stand out better if you predict in the “off-season”. So are you ready to look into the future? Try your hand at writing and submitting a few prediction articles; then come back and post a comment telling us what we can expect in your area of expertise. Looking for an example of this article template in action? Check out “Top Five Business Predictions For 2010” by Expert Author Lesley Charalambides for a good model of how to put it into practice. This is really a nice share and especially points number 2,3,4 and 7 can help a lot to shape out things well. I really like your point number (7). So many times when people write articles they make you feel like it is only there way. It is good to leave it up in the air, and say something like it “usually” happens, and this is just “my point of view.” Nice post. A really nice way of thinking and conjecturing into the future of things. This is all new to me. Where do you add these HTML tags in your article? They go right in the main body of your article and surround the text you’re trying to enhance. For example this sentence: I absolutely <b>love</b> making videos. Would look like this in your article: I absolutely love making videos. I hadn’t thought of this concept–but you’re right, making a reasonable-sounding prediction does confer an instant aura of credibility. Thanks! I liked the idea and substance of the prediction template. I’ve saved it and look forward to using it the next time a prediction bubbles up in my intuition.